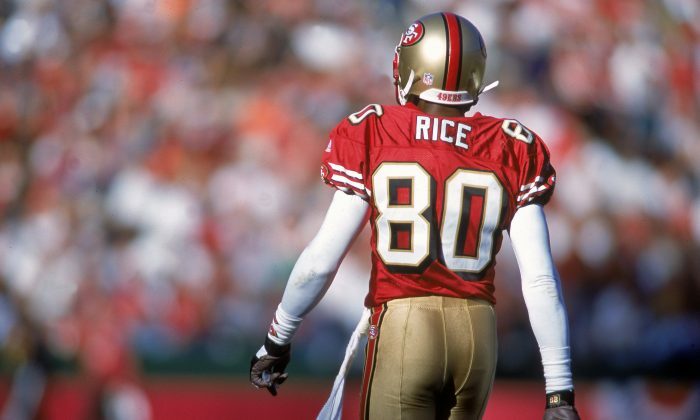 Jerry Rice, the greatest wide receiver of all time, called out San Francisco 49ers quarterback Colin Kaepernick for not standing during the U.S. National Anthem on Friday night. Rice, who played most of his career for the 49ers, wrote on Twitter on Aug 29: “All lives matter. So much going on in this world today.Can we all just get along! Colin,I respect your stance but don’t disrespect the Flag.” He used the “all lives matter” phrase, which is used in response to the “Black Lives Matter” movement. Kaepernick had been sitting during the National Anthem for the past two preseason games. It wasn’t until the night of Aug. 26, when he was suited up to play, that the national media noticed. The tweet from Rice, who played 20 seasons and is considered by some to be the greatest NFL player of all time, drew a mixture of comments.